Not a terribly remarkable statement on its own, I have to admit. Except that it’s currently 15:15 on Friday afternoon and ordinarily I’d be sitting at my desk tweaking some code on my PC. Which is exactly what I’d been planning to do today had it not been for the fact that at around 13:00 St Andrews suffered what can only be described as a major power cut. The power to our building went. The power to the library next door went. In fact, the power went to the majority of two of the three major streets in St Andrews: North Street and Market Street. And no power equals no work, as I’d foolishly left my wind-up PC at home. 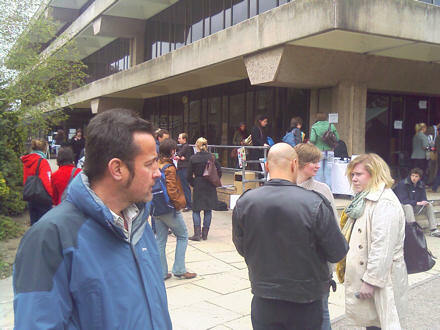 The photograph above shows staff and students standing about outside the main university library waiting for the power to return. Actually, the photograph above shows nothing much out of the ordinary: there are always staff and students hanging about outside the library. It was business as usual for the members of the Kate Kennedy Club sitting at desks selling tickets to the May Ball. According to the word on the street — from our resident team of boffins — power wouldn’t be restored until at least 16:00, but more likely 18:00 – 19:00. Thankfully — I assume due to some cunning jiggery-pokery (a technical term) — the main university website is still live and accessible from the outside world, as is the content management system and the test server for the new site … which we’re supposed to be launching on Thursday (10 May 2007). What terribly bad timing that we should lose power today: the Friday before a Monday bank holiday (and one of our five statutory annual holidays) a few days before a major website launch. Thankfully, however, I backed up all my current work to my external hard drive last night. Still, I wouldn’t like to be working on IT Helpdesk when they get the 500 enquiries from students complaining that their morning’s unsaved work has disappeared into the ether. I’m off to pack now — we’ve back in Selkirk this weekend. Next project: books. Previous Previous post: Encountering God in Kerrang! Next Next post: At last, I have a Flickr account!